July 2015 Ranger’s Report – Fire and Ice! What a month of contrasts we have experienced! 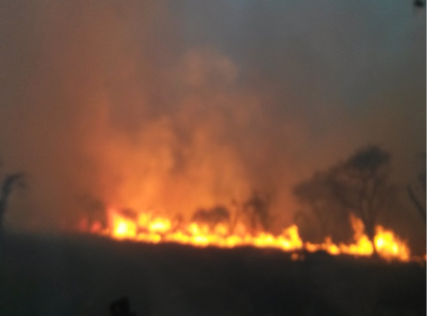 Three weeks ago, all hands available battled a serious runaway veld fire, which, coupled with high warm berg winds and extremely dry and brittle veld and vegetation conditions made for a serious risk to 3 of the lodges situated in the centre section of the reserve. 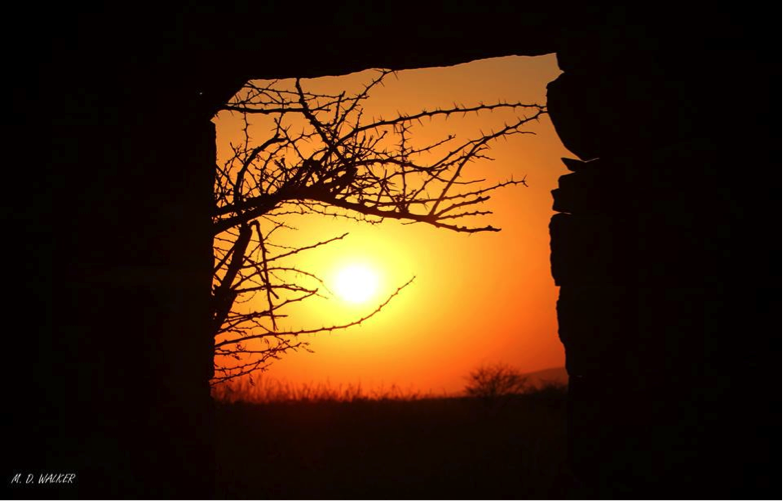 The fire was started well outside the reserve’s western boundaries but being egged along by the wind it picked up and consumed everything in its path, and as a result, managed to jump the western boundary and swept from west to east through Nambiti. 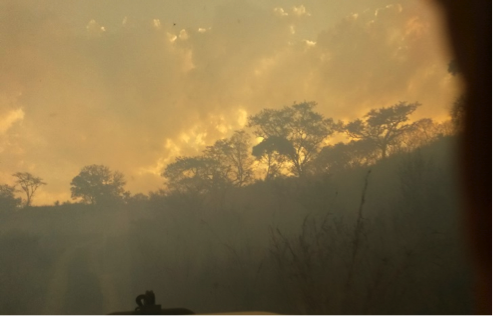 The fire was mercifully bought under control the following day, with approximately 800ha of land being burnt.A week after this was brought under control, we had blessed, much needed and desirable rain (28mm recorded at the lodge) over a 3 day period. Having gone so long without rain, we didn’t quite recognize the wet foreign liquid falling from the sky. This came from the large cold front that graced most of KZN with its presence and resulted in a rather generous snowfall over a majority of the mountains. With a bit of sun, coupled with the rains, the burnt area should start recovering at a rapid rate, already in august we are seeing the first signs of green shoots sprouting, hopefully this will bring forth an early spring flush our beautiful endemic and special wild flowers. We certainly look forward to this. An interesting sighting or observation that has come from all the drama is that of 4 white storks (Ciconia ciconia) that made an untimely appearance the day after the fire. The birds were seen working some of the burnt areas near the old Dutch homestead. The white stork is generally a Palearctic migrant species- which in simpler terms means they should technically be a million miles away over the great pond in Europe at this time of year. The mere presence of these 4 individuals means that they either missed the bus completely or there is a local resident population on some of the adjacent farmlands for them to arrive so quickly to exploit the bounty of food that has appeared. 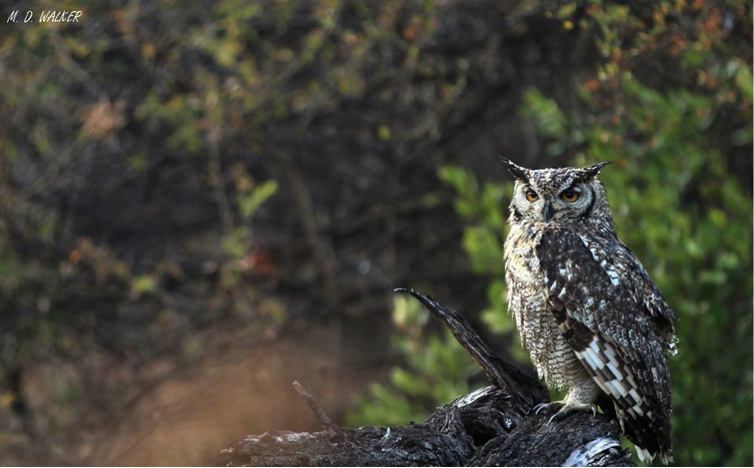 Another great sighting of the feathered variety was that of a Spotted Eagle Owl in early morning daylight, a rather unusual occurrence (must have had too much coffee the night before), and man oh man did he sit nicely for the cameras! Something of great excitement amongst Ranger’s is that due to the lack of ground cover and vegetation being burned off, there have been not one but TWO sightings of a young leopardess within 5 days of each other- so they ARE here! Matt finally had his first sighting of one of these elusive cats on Nambiti in over a year albeit a long distance one, you can imagine his elation. So here’s hoping for more sightings of these ever secretive creatures in future.